In our book club with, “And Baby Makes Three” (Gottman & Gottman), we continue to explore research-based insights and practices for helping couples heal and strengthen their relationships. Last time, we summarized research about the types of stresses that all couples endure after a baby enters the picture. But as the Gottmans write, “baby’s arrival doesn’t inspire new issues to fight over. In fact, most themes grappled with by couples remain static, from age twenty to age eighty.” (p. 50) This is why readers who don’t have kids, or even want them, can still benefit from following along, working with the book, and trying these practices. 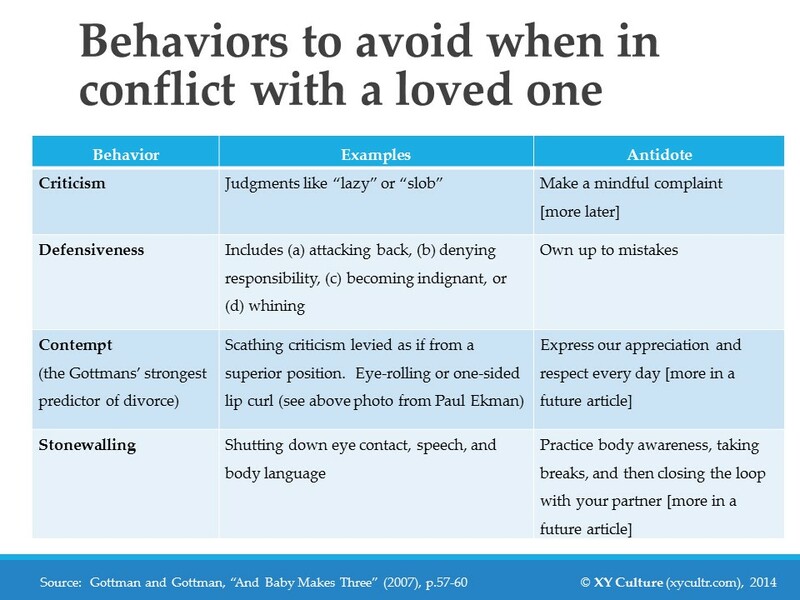 Here we kick off a major focus of John and Julie Gottman’s book, “And Baby Makes Three”: conflict. As a measure of how important skillful conflict management is for maintaining healthy relationships, the book devotes over half its chapters to the subject. (We skipped Chapter 2 on babies and will pick up with that later). Fighting with our loved ones can feel terrifying, and it’s easy – if we don’t know what we’re doing – to get trapped in bad habits that lead to the deterioration of our marriage or long-term relationship. Fortunately, as we discussed earlier, conflict is natural and to be expected. You may find it helpful to print out or adapt this table as you like with examples or descriptions that most resonate with your own behavior. Please see the book for detailed examples. Another way to remember these is with a mnemonic I find helpful: Connect; Don’t Carve Scars. It reminds me of the central message of these skills: focus on connecting with the feelings of the person you love, no matter how intense the conflict is, and do your best to avoid hurting them by carving scars into your and their psyches that will become increasingly hard to repair. Do you do any of these toxic behaviors? If you do, it’s alright, because that’s why you’re reading our articles and the Gottmans’ book: to derive new insights and practice what’s necessary to improve your behavior. It’s all part of a learning process, and one, unfortunately, that was not generally role-modeled or taught to us by adults when we were children. The Gottmans’ revolutionary scientific studies of relationships didn’t reach mainstream until approximately the 1980s and 1990s as they built momentum from long-term study after study. Many of us never heard of such research until Malcolm Gladwell’s “Blink” in 2007. And if we assume most of our readers were born between 1950 and 1990, then it stands to reason that almost none of our parents knew about these successful relationship behaviors or practiced them. Thus we have a unique opportunity as some of the first generations of Americans to take this research to heart, putting it into practice in our daily lives to strengthen our relationships, and in turn, for those of us with children, we have a wonderful opportunity to role model healthy behaviors for our children. Before you roll your eyes or turn one corner of your mouth in contempt at what sounds like a formula, it’s not. These are just suggestions for what content or topics to include when you complain skillfully. You need to adapt these suggestions into your own voice and way of speaking. Consider them guidelines only. You may recognize this three-part framework from Nonviolent Communication (NVC) we discussed in an earlier article about tools to cultivate emotional awareness. It’s the same idea, with two exceptions. NVC also asks people to frame their feelings in terms of what psychological needs are or are not being met. And the Gottmans’ approach emphasizes stating your feelings first (or “what is alive within you,” as NVC author Marshal Rosenberg puts it), rather than describing the problem first. I like this approach because it shares with your partner a gift of your own emotional truth that can allow you to connect with vulnerability and care. By contrast, if you start with an accusation or judgment, or even an objective-sounding observation of the situation, you’re almost sure to provoke your partner and avoid connecting altogether, and pretty soon the fight spirals out of control and you forget after a few minutes what started the altercation. I also prefer the Gottmans’ approach because I find the “psychological needs” element of NVC is just too complicated for most people, and per the Gottmans’ research, sharing this level of detail may be unnecessary. Sounds great, right? Just put these new practices into place and it will be smooth sailing – relationship healed? Check. Not so fast. Let’s face the reality that these skills may be very difficult to learn. If you are not in touch with your emotions, it may take days or weeks or months or even years of reflection before you understand how you actually feel (more on how to cultivate emotional awareness here). 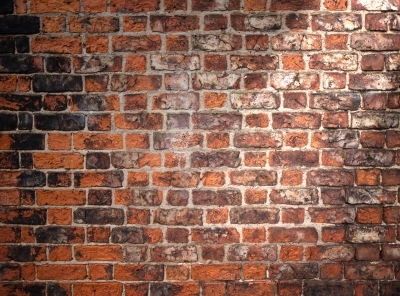 Men may feel particularly challenged in this area – not having had many male role models growing up who openly expressed their emotions, or encouraged men to do so – but this can affect women, too. There will not be an easy solution. But if you work patiently and keep trying, you will see fruits of your efforts sooner than you might imagine. Finally, when is a good time to fight? I’ve heard parents claim that one should never fight in front of the kids, while others say you should do it to show them how to resolve arguments. What do the data suggest? The Gottmans have found that if your child is between birth and four years of age, you should always fight and resolve conflicts away from the child. At these ages, kids are just too immature to understand the fighting as anything other than a threat to the security of their home and family, and as a result, such fighting can lead to psychological and emotional problems for your child. If the child is between four and eight years, then the Gottmans indicate it’s alright to have a minor fight in front of them, as long as you resolve it. They provide more detailed suggestions on p. 52-53. They also learned that “master” couples regularly discuss issues in their relationships (typically once a week), avoid doing so over a meal, and never bring up more than 1 big issue at a time. Did you try the exercises in Chapter 4 with your partner? If so, what did you learn? What were your reactions to the four behaviors to be avoided? What are the situations and issues that cause the most conflict for you and your partner? Write these down and then use them to practice the exercise on pages 62-63 with your partner.